If your cosmetic dentistry wish-list includes a total smile transformation with minimal treatment, veneers may be ideal for you. At Dental Care Center, we provide porcelain dental veneers in Gillette to ensure our patients feel confident about the way they look. Call our office today to learn more about cosmetic dental treatment with veneers. Veneers are intended to conceal flaws and reshape individual teeth in your smile to enhance aesthetic. Whether teeth have been flattened by uneven wear and tear or have been chipped and discolored over the years, veneers provide a comprehensive solution. Porcelain Veneers – Traditional veneers require buffing enamel t to allow the porcelain to sit flush against the natural tooth surface. This helps your smile look natural, instead of bulky or fake. With this approach, treated teeth can also be made to appear straighter, creating a flawless smile. No-Prep Veneers – As an alternative to traditional porcelain veneers, no-prep veneers can be used in specific cases. These cosmetic restorations are typically recommended when a patient has small or pushed-back teeth. As there is minimal or no preparation before veneers are applied, they do add a minimal amount of height to your natural teeth. Drs. Hokanson and Bouzis take detailed impressions of your smile during your veneers consultation to ensure your prosthetics are a natural, comfortable fit for your smile. These restorations are specially fabricated at a dental laboratory and are bonded during a second, follow-up appointment. With just two visits to the dental office, you can have the smile you’ve always wished for. While we are conservative in our application of veneers to preserve natural tooth structures, veneers can be used to create full smile makeovers. Instead of simply applying one or two of these restorations, our cosmetic dentists can provide 10 veneers to cover all teeth in your smile line. With a smile makeover, your visible teeth will look bright, balanced, and healthy. Comprehensive veneers application is the easiest way to achieve several aesthetic goals, without completing multiple procedures, ranging from orthodontics to teeth whitening. If several or most of the teeth in your smile zone are crowded, stained, and physically damaged, full application of veneers can help you see the results you’re looking for. Ask our Cosmetic Dentists about Dental Veneers! If you’re ready for a whole new smile, contact Dental Care Center, LLC today. 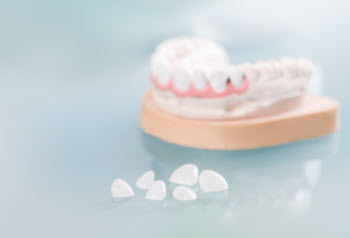 We provide porcelain dental veneers to create a polished and attractive new aesthetic for your smile.